Lovely hotel, but some irritating maintenance issues, such as the cover in the shower cubicle loose, some of the paintwork could do with a touch up. Only just a five star because one of these things and I was surprised about was that there is no dress code applied in the restaurant in the evening - people would come straight from the pool or beach to dinner. Also I felt some of the younger bar staff found it difficult to understand some English terms but were very pleasant and perhaps would benefit from some more training. However, there were very few English staying at the hotel, many Russian and Rumanian but this added to the charm because you realised you really were abroad! A few words of Bulgarian was greatly appreciated by the staff. Beautiful hotel! We took a walk down the boardwalk and we both agreed that the Hermitage was the best hotel in Golden Sands. Impeccably clean, sparkling! Great location - right on the boardwalk, but the rooms are sufficiently far from it so one does not hear the noise. The beach and sea are right on the other side of the boardwalk. Chiflika is lovely, charming Bulgarian restaurant, in the immediate vicinity of the hotel. The staff speaks good English. We were given a beautiful, spacious deluxe sea view room on the ninth floor. We were told that the elevators only went up to the eight floor and that we would have to take the stairs to the ninth. But have no fear, bell boys are standing by, eager to help with your luggage. The view was worth it. From our little balcony we could see Balchik and all the way to Kaliakra - and of course, the huge pool and the ship-turned-restaurant "Golden Dreams". Breakfast was included. Lots to choose from. I am a vegan and I still found plenty. I would definitely return. Comfort and luxury. I mean, the bathroom had two sinks. In the closet there were slippers and beautiful bathrobes. The safe is free (although parking isn't). You'll love it. Stayed at the kempinski golden sands for 2 weeks and decided on half board, on arrival hotel looks all of its 5 star rating with impressive lobby and facilities booked de lux sea view rooms and rooms were lovely especially bath rooms which were huge with a great walk in shower and a his and hers washbasins. Beds excellent and our single friends room was similar to ours but with a king size bed which she loved but single supplement is extremely high but I understand that if booked privately it is much cheaper. We picked out a 'late' deal with Balkan-Holidays and only chose this particular hotel because of the amazing price. We were very pleasently surprised when we got there. Rooms were great; good size, and extremely clean. Food was lovely, and the staff extremely friendly. 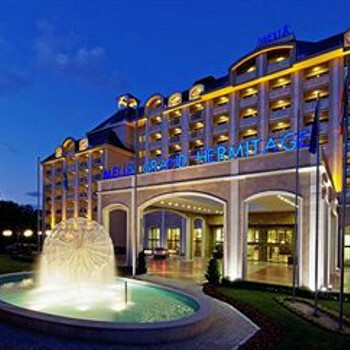 Our first visit to Bulgaria and it was great that we picked the Kempinski as our hotel. Hotel was spotless,hotel and the pool area being cleaned all day every day. Food was very good with plenty of choice. Breakfast was a bit manic,very busy,had trouble getting the waiters attention for tea coffee etc, but then the evening meal was very different, it was a lot different and much quieter. The evening meal was theamed every night, ie Asian African Italian Bulgarian and more , also there was the usual pasta, meats, and vegatables.a good selection over all. Staff very polite, most speak English. my partner and i had never been to bulgaria before but got a great deal for this hotel and decide to give it a go. the hotel was lovely , just what you would expect. with the staff nothing was a problem. the leisure facilities were great and spotless, as was the restaraunt, all i can say is if you enjoy a nice coffe on a morning take your own in to eating area and help yourself to the hot water as bulgarian cofee is a little strange tasting. and thats about all i have to say the hotel is fab. We stayed at the Kempinski 11th - 18th May 2006 and had a wonderful time. It was the start of the season, so the resort was only just starting to come to life. The Kempinski was certainly open for business - they are making a few finishing touches e.g. the grounds leading to the beach, and I don't think the casino was ready but there was no real disruption. The staff were absolutely excellent - a real display of genuine customer focus. My only improvements would be better signage for hotel facilities and better communication between staff re. flexi-dine packages. During this stay the hotel was just re-opened again. Business seemed to be pretty slow although there was some large conference going on. The hotel overall seems to be finished now. With my various stays in Bulgaria, all over, I must say the food is definatelly among the best in the country! What I like most and hope during my next stay when I want to come with friends is the green surrounding. The resort is very crowded and this hotel has a small but really nice green area between itself and the beach. From the pool deck you can see the black sea.